This entry was posted in Uncategorized and tagged class agreement by windowsintolearning. Bookmark the permalink. I’m happy that you like our class agreement. Did you know that our portraits are made of real school dresses and t-shirts? I have been doing lots of reading. Have you too? I’m enjoying art the most. What has been your favourite thing about your year so far? 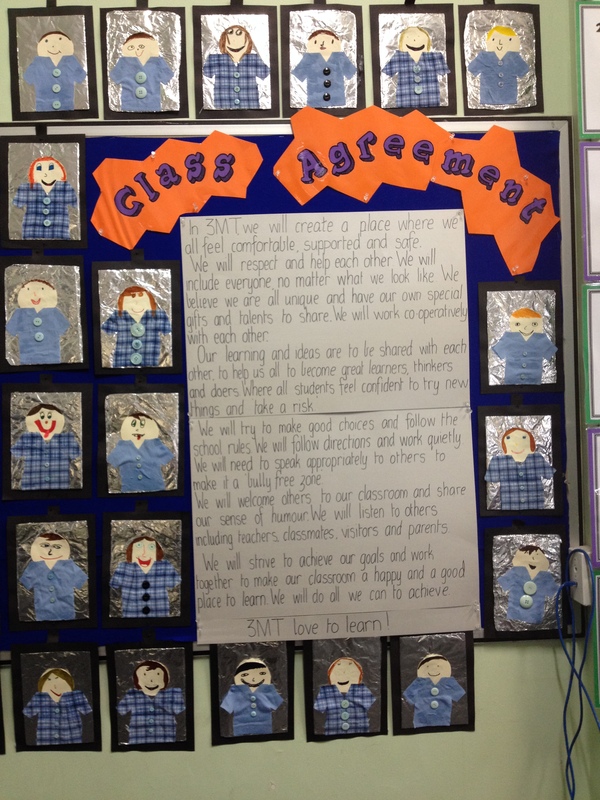 I really like the way you worked together in groups to allow everyone to have their say in your Class Agreement. You have included so many important things that will make your classroom a great place for learning this year. The other thing I love are the portraits you have made of yourselves – they look fabulous! I’m sure you have had a wonderful start to the year. What are you enjoying so far about being in Year 3? I wonder if anyone has accidentally gone to the Junior building yet?